What is this spumoni business all about? It’s a frozen ice cream or gelato dessert of Italian orgin. Everyone makes it different but you can bet on a combination of chocolate, pistachio and cherry at the very least. Expect to see versions with vanilla, whipped cream, almonds and nuts, amaretto, fruits, berries or whatever else fancies the chef. It’s typically served molded or in slices but individual scoops smothered in nuts and cherries and fudge and whatever else happens too. 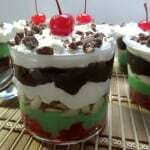 Spumoni is a freestyle dessert – no rules are needed here. 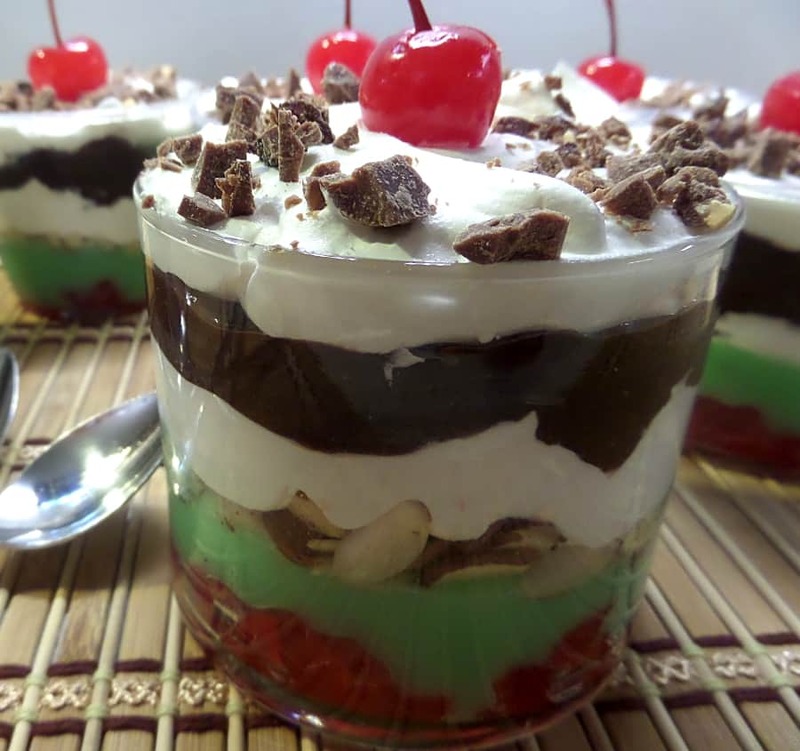 Yum….spumoni. 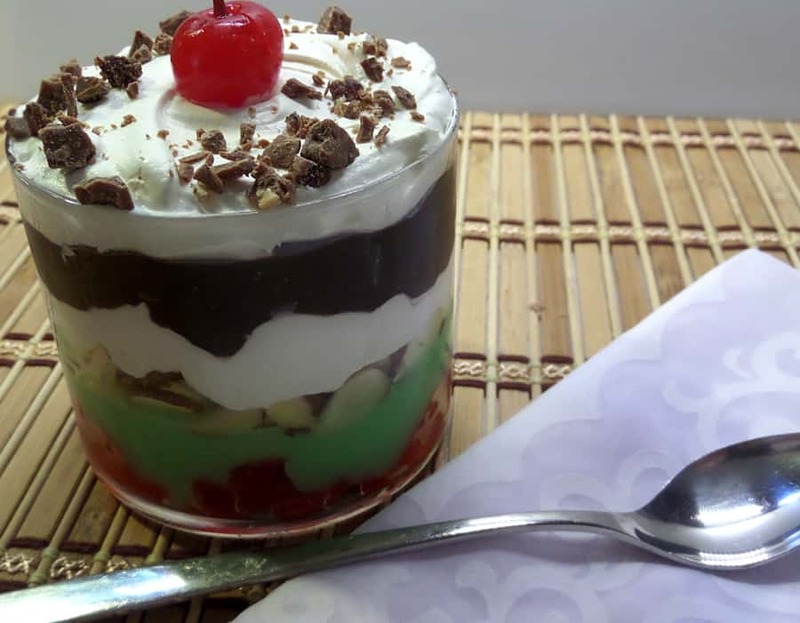 I couldn’t let this day or dessert go unnoticed even if I am on vacation….I LOVE THE OUTER BANKS : ) So with limited ingredients and a very basic kitchen – I whipped up something super simple and delicious with my love for spumoni. 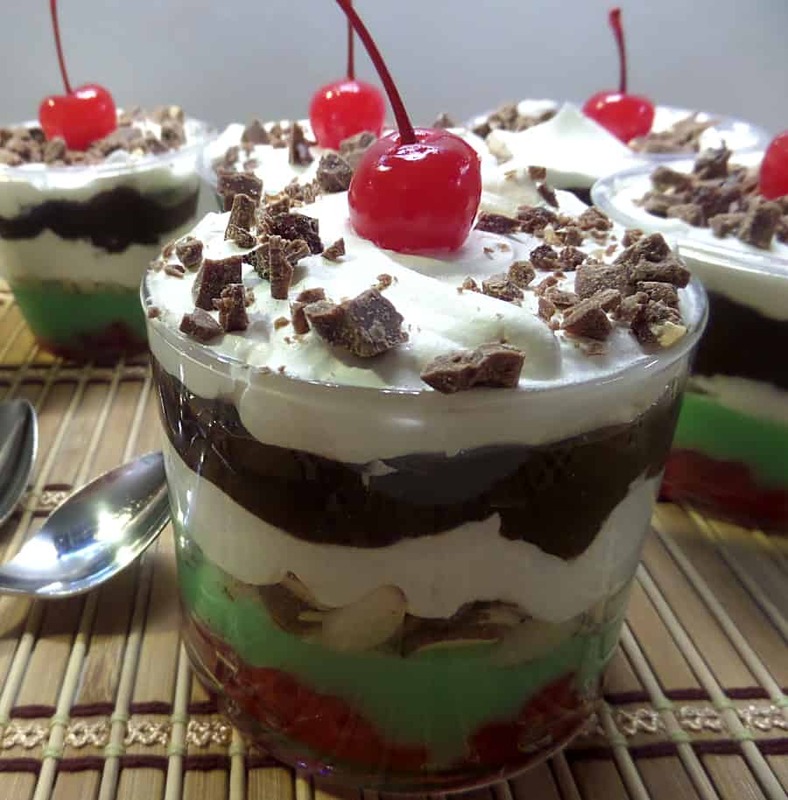 Instant puddings, maraschino cherries, sliced almonds, cool whip and a chocolate bar make an easy, pretty and delicious layered pudding version of this dessert. Keep in mind that I’m making this nice and easy – my vacation is about being on the beach as much as possible and in the beach house and kitchen as little as possible. Feel free to make your own puddings and whipped cream. I didn’t give any exact measurements when layering the ingredients in the cups. Amounts will vary with how many individual puddings you make and by preference. I did have some cool whip and chocolate pudding left over. I made 6 large pudding cups, next time I make this I would probably make 8 instead. Either way, this will make 6 – 10 individual cups, depending on size and appetites. 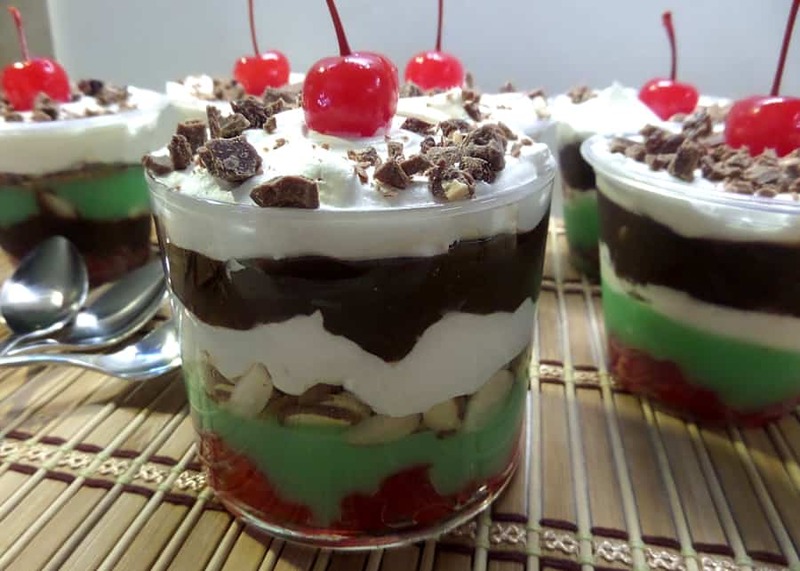 I evenly layered the chopped cherries on the bottoms of the cups followed by pistachio pudding, a spoonful of sliced almonds, cool whip, chocolate pudding, cool whip, sprinkled with chocolate bar crumbles and a cherry on top. Quick, easy and looks so much fancier then it really is. Gather glasses / cups for pudding. This will make 6-10 servings. Prepare puddings following packet instructions. Usually it's something like 2 cups milk whisked with pudding and let set for 5 minutes. Wrap remainder of cherries in a paper towel for a few minutes to absorb excess liquid. Hi Amanda, it is me Abby. This pudding sounds DELICIOUS ! I love pudding. Although I don’t have a baking/cooking blog like you I would love it if you still visited my blog. In my free time I will try to come to your blog, and look at your recipes. When I get home I am so trying this recipe. The URL to my blog is http://blog.elanco.org/forre5yz/ Happy Blogging ! Hi Abby! That pudding IS delicious – I’ll have to make it for you guys sometime! I’m thinking about working on a second blog this summer…I’m excited 🙂 Hope you’re having a good day – hugs! This looks so good REALLY Good!!!!!!! Keep making things that are o good! !